Being a single parent means that I never get a break. It’s just me and my daughter. Well that can wear a person out. Somedays you just need to go Christmas shopping without a little one with you. How can I keep the magic alive about Santa if I can’t be Santa because I cannot get away? Or there’s events that are not kid friendly. What do I do now? Normally I ask a relative but they have lives too. 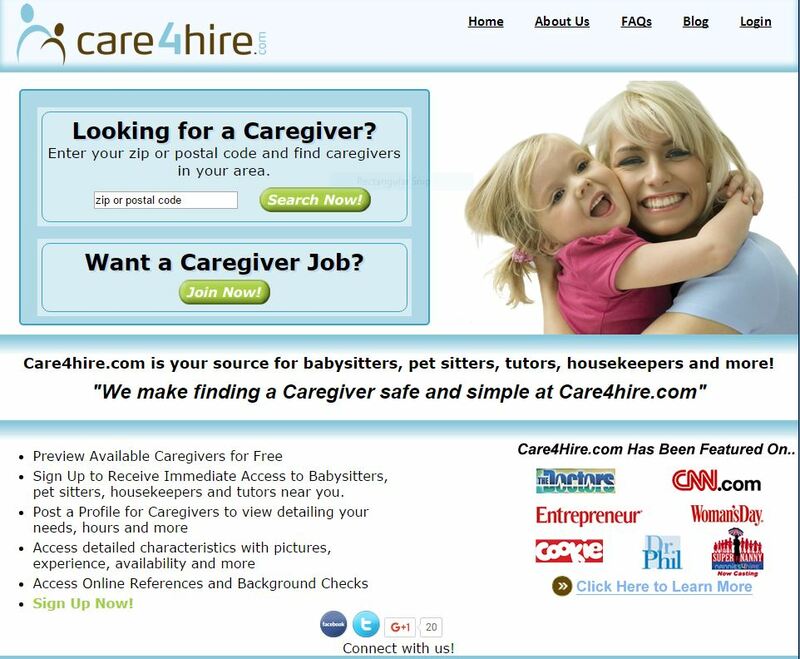 Care4Hire.com is a website for parents. Not just single parents but all parents. On Care4Hire.com you put in the criteria you would like in a sitter, pet sitter, tutor or even just help around the home. You can search for the specific job you need help with, pay range and many more specifications to help narrow down your search. I was hoping to find occasional help with my daughter. She’s 5 years old, nearly 6, and is self sufficient. But I was unlucky finding anyone in our price range. I really was not surprised. The baby sitters in our area feel that $15 an hour is the lower end of the spectrum for 1 child. With Care4Hire.com I am able to weed out those with the high salary expectation and find those in my price range. From there I can look at their availability, if they smoke, do they have a car and much more. It saves me time! I don’t have to sift through pages and pages of emails or return dozens of calls. I can create my customized want list and post. Those that are interested can respond and I can take it from there. I love that! Do you know how many phone calls and interviews I have had just to find out they would like $20 an hour? $20 an hour for 1 kid! Yeah, so I’m a single mom with no child support. I do not see me shelling out $20 an hour so I can go to a wedding or go grocery shopping. Heck if I paid $20 an hour there would be no need for Santa cause Santa would be broke! I am a very picky parent when it comes to someone watching my child and as of yet I have not contracted with someone off of Care4Hire.com. But I do like the system. Everyone is clear about what the expectations are. I know what they are expecting from me. I know if they are CPR certified, do they handle behavior issues, when are they available. They know what I am expecting, someone to occasionally watch my 5 year old child at $7-$9 an hour and I’ll pay for activities, special food request and supplies for projects. I feel like it makes finding a care giver much less frustrating. So now when I see someone wanting $20-$25 an hour to watch my child I just delete and move on. I’m sure there are families out there that can afford that or if you have multiple kids that is a deal. But for 1 kid and a single income household that is too much. If you are having a hard time finding someone to watch your child(ren), pets, need a tutor or a housekeeper I highly suggest Care4Hire. They will take the frustration and guess work out of it. That is a great service.It certainly saves a ton of time looking.